This Sarawak Rainforest Music Festival holiday does have traditional music as a main feature of the trip, but just as the festival celebrates music from global artists, international indigenous peoples and Sarawakian tribes, this trip also encompasses many exciting aspects. Travelling in a small group, the trip starts in Kuching, the capital of the Malaysian state of Sarawak and ends in Kota Kinabalu, capital of the Malaysian state of Sabah, both on the island of Borneo. The Festival takes place during day two to four on the holiday and is a unique annual gathering of worldwide music talent. You stay in a hotel in Kuching during the festival, with shuttle services to take you to and from the festival. After the festival the cultural journey continues, as we spend a day and a night with Matthew Ngau, a local musician who plays the festival and then invites us into his home to teach us about local instruments and also stay in his family run accommodation. From culture to nature, the next few days are spent exploring two of Sarawak’s most stunning national parks, namely Bako and Mulu. The former is Sarawak’s oldest national park, with pendulum-faced proboscis monkeys, bearded pigs and long-tailed macaques. The latter is a UNESCO World Heritage Site and home to monumental karst limestone landscapes, caves, gorges and peaks. A longboat river trip here is a highlight for many of our guests. This trip also includes a visit to the world famous Semenggoh Orangutan Sanctuary, a fundamental centre for rescuing and rehabilitating Sabah’s most famous headline act. We believe wild animals should be viewed – without contact or interaction – doing what they do best: living in the wild. On this tour we stay in Gunung Mulu National Park, one of the best national parks in Sarawak. Whilst here we ensure we follow all the local laws and support the conservation projects run by the local government. Our travellers are always asked to take any rubbish with them when hiking through the parks, to ensure no litter is left behind. 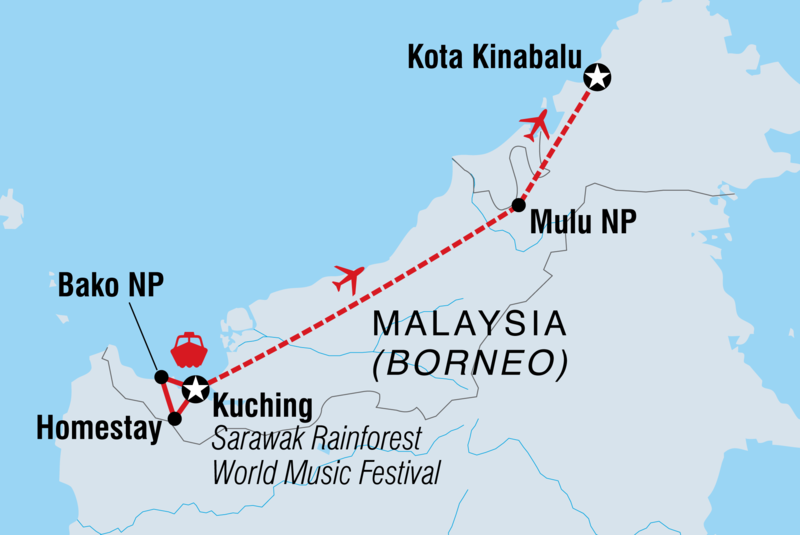 The Rainforest World Music Festival is a unique three-day event that brings together famous musicians from all over the world, as well as indigenous artists from the beautiful island of Borneo. Informative afternoon workshops followed by amazing evening performances, make this festival a celebration of many different cultures and customs from around the world. Travellers will also have the chance to learn all about Sarawakian music, from both the festival and a local homestay. One of the festival performers will play host to our group at his home, and passengers will be able to see how the sape – a local musical instrument – is made and played.